How to import to Sri Lanka? What are the import procedures in Sri Lanka to move goods? Explain about import registration process, cargo movement to Sri Lanka from overseas countries, Import delivery process in Sri Lanka etc. Detail the import methodology in Sri Lanka. This post explains about step by step procedures that need to be finished with Sri Lanka government authority for importation to Sri Lanka. Sri Lanka Customs is operating under Ministry of Finance and Mass Media which are responsible for facilitating legitimate trade, facilitates international trade, collection of revenue, collection of export import data etc. In Sri Lanka, the Good declaration is known as the CUSDEC ie, Customs Goods Declaration. The importer is required to make Customs Declaration through DTI for the Import Cargo. The Automation of processing has been now fully implemented through: “Asycuda World” to facilitate the importers to process the CUSDEC without delay. Any delay in filing or absence of documents can delay the clearance process and thereby importer supposed incur demurrage on the imported cargo. The efficiency of the Customs Clearance process is depend on having the valid documents, the accuracy of the information provided in the documents as well as the promptness in submitting the documents and filing the necessary applications for the Customs Clearance. This post explains about different phases in import process that every importer needs to go through in Sri Lanka. How to import to Colombo? Formalities for import to Hambantota. Procedures to import to Colombo. Need to import to Hambantota. Explain to import to Colombo. Information to import to Hambantota. 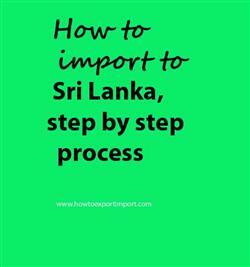 Step by step process to import to Colombo. Methods to import to Hambantota. Guidelines to import to ColomboPlease guide to import to Hambantota. Help to import to. Procedures required for importing to Colombo. Requirements to import to Hambantota. Clarifications to import to Colombo. How can I import to Hambantota. What should I do to import to Colombo.